The fortuitous investigation of a case by persistent journalists, rather than the workings of the limited appellate process, has led to the exoneration of a number of innocent individuals. Maurice Possley (l.), a former reporter for the Chicago Tribune, recently wrote how he and fellow-journalist Steve Mills (r.) helped free Daniel Taylor (c.) in Illinois, where he had spent more than 20 years in prison. In 2001, the reporters published a story exposing the false and coerced confession that led to Taylor’s conviction, but it would be more than a decade before Taylor was freed. Evidence showed that Taylor was arrested for fighting and was in jail on the night of the murders in question. Eventually, the state discovered documents in the prosecutor’s files that had remained hidden for 19 years indicating police officers were certain Taylor was in jail and could not have committed the crime. Taylor's is among the 1,200 wrongful convictions listed in the National Registry of Exonerations. DPIC’s Innocence List includes 142 death row inmates who have been exonerated and freed. Such investigatory reporting contributed to Illinois's decision to abolish the death penalty in 2011. Taylor was freed on June 28, 2013. He had not been on death row, but 20 other men who were convicted of murder and sentenced to death have been exonerated and freed in Illinois. 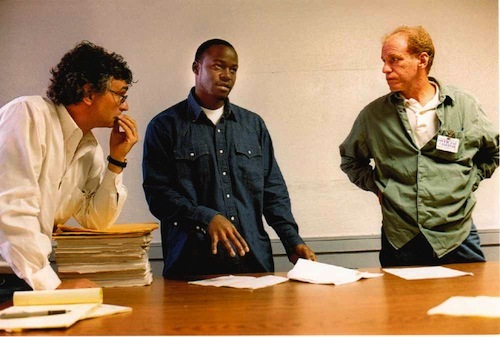 (M. Possley, "How Two Newspaper Reporters Helped Free an Innocent Man," The Atlantic, August 29, 2013; picture courtesy of M. Possley was published in The Atlantic article). See Innocence and Arbitrariness.